National Grid is proving it’s serious about renewable energy, with the largest solar power project in Massachusetts, which is also the largest roof-mount solar project in the northeastern U.S. When officials with National Grid, a large, international investor-owned utility that serves the northeastern United States, talk of being a leader in renewable energy, they aren’t just uttering hollow words. They point to their one-megawatt Whitinsville, Massachusetts, solar project that went online in May 2010 and four other PV projects in the works as proof. Altogether, the projects will total 5 MW of production when completed. Dagher points out that renewable energy has additional values, including environmental benefits—such as the 1.3 million pounds of annual carbon emission reductions the Whitinsville project will deliver—that may be hard to translate into dollars and cents. When the Whitinsville project went online it was the largest solar project in Massachusetts and the largest roof-mount solar project in the Northeast. Nearly as impressive as its stature is the fact that the Whitinsville project came in under budget and ahead of schedule. Dagher credits the cooperation of general contractor Nexamp of North Andover, Massachusetts, subcontractors, and suppliers with the feat. Scott McClintock, vice president of sales for Nexamp, says his firm was able to accomplish its goals by working with National Grid from the early stages of the project. The Northeast may not be a mecca for solar power generation at the moment. But Dagher says National Grid and others are in the process of changing that. “If you look at the solar data for Massachusetts and the weather data that’s available from NREL (National Renewable Energy Laboratory), it’s a great location for solar,” Dagher says. The moderate winter temperatures in the U.S. Southeast are better for solar generation than Massachusetts. But the Northeast is better in the summer, since the region’s moderate climate is more conducive to solar generation than the 100 degree-plus-temperatures the Southwest typically experiences. The Whitinsville, Massachusetts, solar project (above) and four other PV solar projects that National Grid has in the works in Massachusetts will total 5 MW of production when completed. Dagher says Whitinsville and the firm’s four other solar projects were made possible by the commonwealth’s 2008 Green Communities Act. Under that legislation, utilities are allowed to own up to 50 MW of solar generation. Before deregulation, utilities could only own transmission and distribution facilities but no large solar generation facilities. In addition, the Green Communities Act requires all of the commonwealth’s investor-owned utilities to enter into long-term contracts to purchase at least 3 percent of their electricity from renewable generators. National Grid has signed an agreement to buy power from the nation’s first large-scale, off-shore wind farm—Cape Wind—when it comes online at the end of 2013. In light of the legislation, Dagher says National Grid began looking at the potential of property and facilities it already owned in late 2008. Of the 20 or so sites, he says they narrowed it down to five including Whitinsville. The utility’s New England Distribution Center warehouse in Whitinsville, with nearly two acres of roof space, was chosen because of a relatively unobstructed roof surface and proximity to distribution lines. It also is the only roof mount of National Grid’s five solar projects. The other four—Dorchester, Everett, Haverhill, and Revere—are ground mount. Once the Whitinsville site selection was completed, National Grid submitted the project to the Massachusetts Department of Public Utilities in March 2009. Gaining the necessary approval and permits was relatively easy, partly because National Grid had already discussed the proposed project and its benefits with regulatory and elected officials. “We had a great relationship with all of the state agencies and even with the local municipalities,” Dagher says. “We were really thankful, and they were more than welcoming of the projects, because they too want to promote renewable energy within the community. The outreach even extended to schools and community groups to educate them about the value the project would bring. “We bring solutions to climate change and the environment,” National Grid explained to the stakeholders. National Grid began legwork on the project soon after utilities department approval in October 2009, including starting discussions with manufacturers and labor unions, all of whom were interested in becoming party to the project. Dagher says National Grid officials decided to finance and own the $6.5 million project itself rather than go with a Power Purchase Agreement because of the speed with which they wanted to bring the project online. The utility’s New England Distribution Center warehouse in Whitinsville, with nearly two acres of roof space, was chosen because of a relatively unobstructed roof surface and proximity to distribution lines. 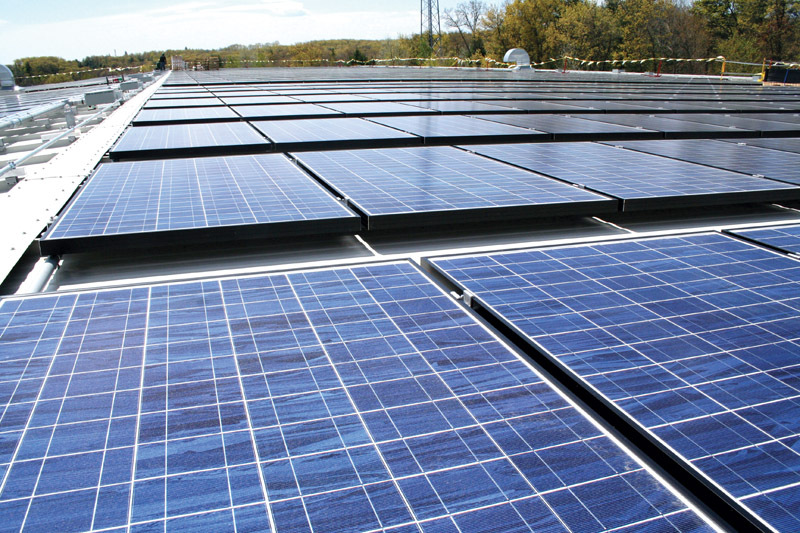 It is also the only roof mount of National Grid’s five solar projects. The other four are ground mount.. In addition, owning the solar facility fit into the firm’s long-term plan to be a leader in developing renewable energy, Dagher says. As owner of the solar facility, National Grid retains the renewable energy credits and plans to sell them on the open market. Overall, he says the project will cost each of the utility’s customers about 1 cent per month over the 20-year life of the project. The Whitinsville project actually comprises two attached buildings. The older building raised some initial concerns about whether it could carry the additional load from the solar panels, each of which weighs 41 pounds. But Dagher says an engineering analysis showed it didn’t need additional reinforcement. The newer, second building actually was constructed with solar in mind. Nevertheless, he says National Grid made sure that the roof could support the additional weight of the solar panels as well as snow loading and wind load factors. When National Grid put out requests for proposals for the project, Dagher says the utility wasn’t necessarily looking for local respondents. It was seeking companies that could provide the best products and services for the price. Evergreen Solar, the PV panel supplier, is based in Marlborough. Dagher says National Grid sought a general contractor that had experience with solar installations of at least 50 to 100 kilowatts. The firm also wanted a contractor that could provide a large number of experienced workers within a short timeframe. Nexamp fit the bill, having installed a total of 3 to 4 MW of solar before Whitinsville, McClintock says. “And we have a skilled labor pool from which to draw, so it wasn’t really a challenge to find skilled labor,” he says. Dagher says they also sought a contractor that shared similar views on worker safety. Not only did National Grid have a safety representative on the site the entire time, but it also hired an independent quality assurance firm to appraise the work. Security was also a factor, since it was a distribution facility. McClintock credited “meticulous planning” for being able to install the system with only minimum disruptions. When National Grid put out its RFPs, it also wanted to use union labor. Lidco Electrical Contractors of Holden, Massachusetts, provided the electrical modifications to the North East Distribution Center building to aid installation. Boston—comprising the International Brotherhood of Electrical Workers locals 96 and 103—performed the electrical installations as Nexamp’s subcontractor. Zapotec Energy of Cambridge, provided design and installation oversight for the system. 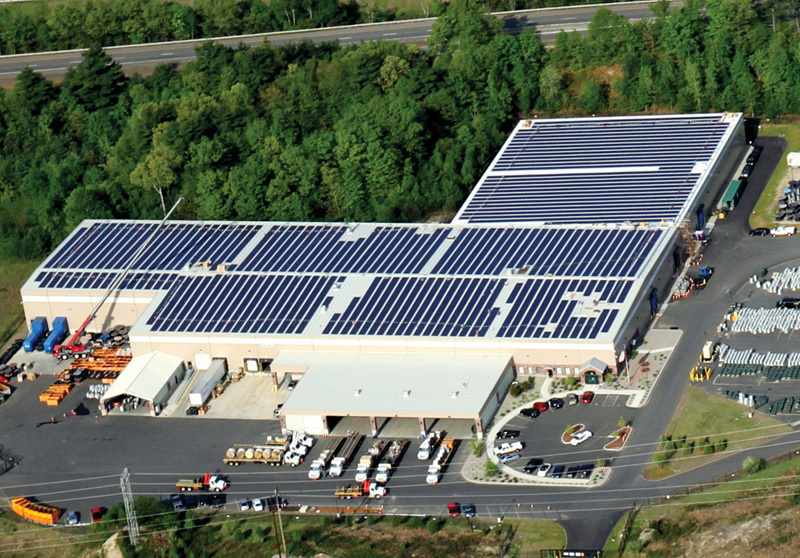 Evergreen Solar Inc. of Marlborough, manufactured the 4,683 210-watt PV panels that were involved. 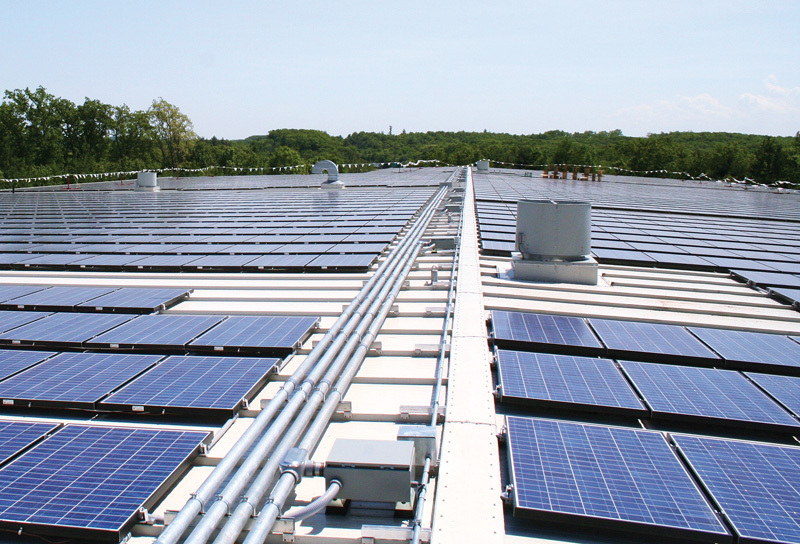 National Grid used the S-5-PV Kit to attach the panels to the seamed metal roofs. The kits from Colorado Springs, Colorado-based S-5! allow installers to quickly and securely mount PV panels without penetrating the roof. Inverters for the Whitinsville project were from SMA America of Rocklin, California.